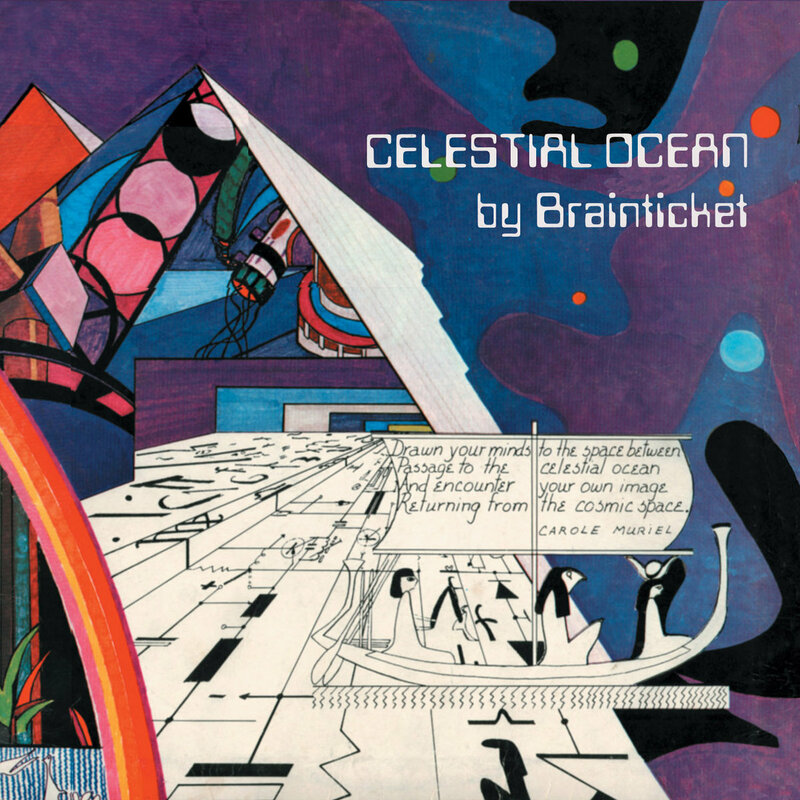 Brainticket is an experimental band most active in the early 1970s, and known for its use of exotic instruments and jazz-inspired compositions. The only constant member has been Belgian musician Joel Vandroogenbroeck. I was born in Brussels (Belgium) in 1938, right in the middle of the German Nazi occupation. I was only four years old that I realized what was the war. Bombings every night, airplanes noises, houses on fire, and I could say now that I had been very lucky also to know later that my father was in the resistance and saved a lot of people. In the middle of all this, I remember that there was an old piano in the house, that nobody never used and as a young child I started to play. I was three years old at that time. I do not remember if anybody teached me and I also know that music was not part of my family. Wait, now comes an obscure remembering that my mother used to sing and had a good voice as people said but this is all what I remember. I grew up and when I was six, one day we heard the sound of canons getting near, I saw those proud Nazis commanders getting rid of their black uniforms in the middle of the street and run away in their underwear. I never forgot that picture. The war was over but we still were starving. Then, another image I will never forget is when a tank appeared with the American flag and a GI offered me a banana and a chewing gum. This anecdote had later a great influence on me, I went during my life many times to America, became a jazz musician, made a lot of friends there. Today, I feel so sorry about what is going on in the US. What is happening? An elected leadership that divides communities, turns into racism, build walls between people, unrespectful to other countries, turning into the worst version of the brutal capitalism. Seeking power at any costs. A war machine is building up very fast and will be ready to conquer the World before we realize what is happening. This has to be stopped!!! People start to hate Americans again and I feel so sorry, as my American friends also feel the same. But we are not here to talk about politics, in fact I don’t care about it as long as we all can live in peace and harmony, we all live on the same planet. (“I might be a dreamer but I am not the only one.” – John Lennon). I am sure that America will find its right balance again. So, lets get back to our (or maybe my) story. I was 6 years old when WW2 ended and we were free. My family took me to the coast, Oostende, Dunkerque. As I remember playing “Lettre a Elise” on the piano for a group of allied soldiers. That was my first concert. After that, life was normal again. I went to school, took piano lessons and grew up peacefully until I was 15. One day a friend came to me with a 78 disc, he was all excited and told me to listen to it because it was something incredible that we never heard before. He had one of the first modern jazz recordings of Charlie Parker and Dizzy Gillespie. I remember it so well: Ornithology, the man I love, Be-Bop, Billie’s Bounce etc. That was it! I was fully into it. Did all I could to find other recordings, which was not easy to get at that time. Dizzy Gillespie’s big band concert in Paris, pianist Bud Powell, and many many others started to emerge in my quest. I started to escape through the window at night to meet with other young jazz musicians in a known jazz club in Brussels where I started to set in various jam sessions between us. I did not do that very often as I had to go to school the next day. This was all very secret. Of course, in the meantime I was studying classic piano music at the music conservatory of Brussels. This had to happen one day: I was summoned at the office of the director. This day I felt like I was sent to hell for my sins. I was brutally kicked out of the musical conservatory of Brussels for taking part of playing a so called jazz music on the piano, totally disgraceful and savaged bad influence to the renommée of this institution. Good bye classic music! It didn’t matter so much to me because I was totally bored with classics. (The teachings of classic music at that time made me hate it. A better teaching would have made me love it.) Much later I came back to classic and I loved it. Some people made me understand it and this was another story. So, my first basic instrument was the piano, obviously because of my piano studies that made me master the instrument. But, at that time, most of the jazz clubs, concert places only had bad and untuned pianos, (electric pianos didn’t exist yet), and most of the time there were no bassists around to play the gig. So, for a question of necessity, one day I grabbed a double bass and started to play it. This was not that hard to learn, just that my hands were full of blisters, hurting a lot. You received the Art Tatum prize as ‘youngest jazz pianist’ at the age of fifteen, and toured around Europe and Africa including performances with the Quincy Jones Orchestra at the World Exhibition in Brussels and the RAI symphony of Rome. What do you recall from those days? Belgian Congo, to play for the SABENA airline at end of the year’s festivities. It was forbidden for us to have contact with the natives, just to tell how strict everything was. Of course, from the first day on, we got in contact and those were beautiful experiences. Some people took us to see the river Congo, from this moment on I understood the incredible natural force of Africa. The Congo river was like a vision. Imagine standing there in front of wild current of yellow streams of water carrying entire fallen trees with it, we could barely see the other side of the river, just like a fine line very far away. The sound of the current water was deep and rumbling like an earthquake. From where I was standing, there was a little fine tree with a small snake sleeping in it. Someone told me: “don’t get closer, they are very fast and if it bites you, you die in 3 minutes”. This was my vision of the day that I never forgot. In fact I wrote one of my preferred compositions “Black Sand” later, remembering this great and strong moment. Back home in Belgium, 1957 was the World exhibition at the Atomium in Brussels. Great place to learn about what was going on in the World. (No internet at that time). As far as I remember, there was the Quincy Jones jazz orchestra giving a show and that was incredible, even more incredible was that during various nights, some of the soloists came to our jazz club for jam sessions. This was my opportunity to play with Zoot Sims (saxophone) and Bob Brookmeyer (trombone) and some other musicians around. We all had a great time to know each other, drink and play all night long together. Then they all just vanished when the exhibition was over. Of course I never did actually work or was part of this orchestra, I would have been too young for that. Just one year ago, I wrote an email to Bob Brookmeyer, who is now over 90 and still teaching composition in San Diego. He did remember the time. My first official real gig was when I was invited at the RAI Television in Rome – Italy to play for a 6 month contract with the Nuncio Rotondo jazz group, as the youngest jazz pianist around. (There are still tracks on Spotify). This was a great and enjoyable experience. Playing with great Italian musicians, making good friends and really enjoying the incredible Italian generosity. Great climate, great food and Rome is a wonderful city with wonderful people. As all good things don’t last, the day came when we had to go. As our drummer was a Swiss percussionist Pierre Favre, We went on for the next gig in Basel – Switzerland at the Atlantis, a famous jazz club that had a living crocodile around. So, we played there for various months and I stayed there for many many years until today still. Basel was a great place at that time with an ideal geographical position, right in the middle of Europe and it was easy to go from there to any place for work and concerts. One of my most important jazz moments was also playing with the group of Eje Thelin, an excellent trombone soloist from Sweden. So I spent more than a year between Basel and Stockholm playing concerts. Spotify: (Eje Thelin quintet at the German jazz festival 1964) among the recordings as a pianist. Unfortunately Eje Thelin passed over being very young and this was an enormous lost in jazz music. Back to Basel I went on playing all around Europe until something happened one day that changed my life to a complete new direction. But this will be for the next chapter. 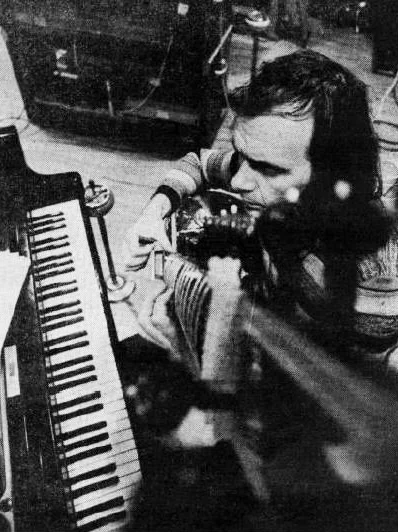 In the late 1960s, you were still active in jazz field, but you also found about experimental bands like Amon Düül II, Can, Tangerine Dream that influenced you to start something different. In the late 1960, I used to listen to the radio at night, this was ‘The voice of America’. One night I heard a piece of music that knocked me out. What was this? Who was it? It was Jimi Hendrix’s “Hey Joe” followed by “Purple Haze”. A totally new concept of music. Never heard something like that. This was so far from classic Jazz. I guess that those pieces changed my life. I went on investigating and of course discovered many other things. King Crimson’s In the Court of the Crimson King, another one that changed my concepts. And of course the Beatles’ Sgt. Pepper’s Lonely Hearts Club Band. Those were the milestones of my new direction. Amon Düül II, Can and Tangerine Dream came much later in different situations. But the very first situation came together with a complete change in the society. Hippies, freedom, free love, flower power, peaceful revolution, LSD appeared from who knows where but it was there and many new generation people experienced it. It opened your mind like a yogi master with the only difference that this was immediate, and a yogi works 30 years to get there. This was too fast and unprepared. Many did the trip and many never came back to our reality. It all changed the society. Families broke apart, we traveled in all directions, seeking new impulses. We were citizen of the new free World. What a clash with the conventional society. In this general concept I went on playing music but not anymore jazz. In fact most of the jazz musician did not talk to me anymore, I was a heretic. I ended up playing ‘Soul music’ at the organ. The band was called Barry Windows and the Movements. There are still recordings around of this band. There I met this great young British guitarist Ron Bryer and we both enjoyed Hendrix, King Crimson and Sgt. Pepper’s Lonely Hearts Club Band all days long. Of course, the soul group felt apart and we created a trio with Bryer, Paap and myself called ‘Third Eclipse’. We started to play around in Switzerland but nobody understood what the hell we were doing. Europe was so behind at that time, except of course the UK. So under their influences you and guitarist Ron Bryer recruited drummer Wolfgang Paap and you formed Brainticket. Where did you guys meet? And what was the initial concept behind Brainticket? jazz organists did) and the drummer Wolfgang Paap appeared from I don’t know where but we also had another drummer with us, Cosimo Lampis who first played in the trio. Anyway, we ended up with a record company and recorded two pieces, “Places of Light” and “Black Sand” (still my best piece remembering my experience in Africa). Having recorded those compositions, things stopped and the record company wanted us to do something with basic electronic sounds they recorded before. What were we supposed to do with this material? There were no loops at that time, so we just played the same rhythm for about one hour. Still, some things were missing to make sense. In the meantime appeared from nowhere Dawn Muir as spoken words vocalist. Dawn and Ron got into something theatrical comedy-drama which was like a couple fighting with words. So, putting it all together came out of it a very special recording that had actually nothing to do with LSD. It is the record company that included this idea in the artwork of the record cover, “only listen once a day to this record. Your brain might be destroyed,” etc… I did not go for that because this was only a publicity to sell the record. 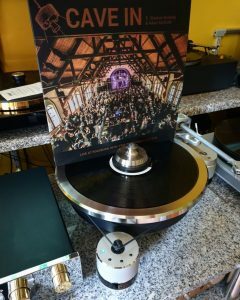 After all that and a lot more of tensions, the LP finally came out. First it was banned in the US, then the German radio defined it as a very bad LSD trip. Anyway above all of this, I didn’t like the intention to turn it into something that I did not want. I cut the contract with the record company and decided to go my own way with the real Brainticket idea that was all different to me. Anyway this record made a hit of sellings as I heard later on. 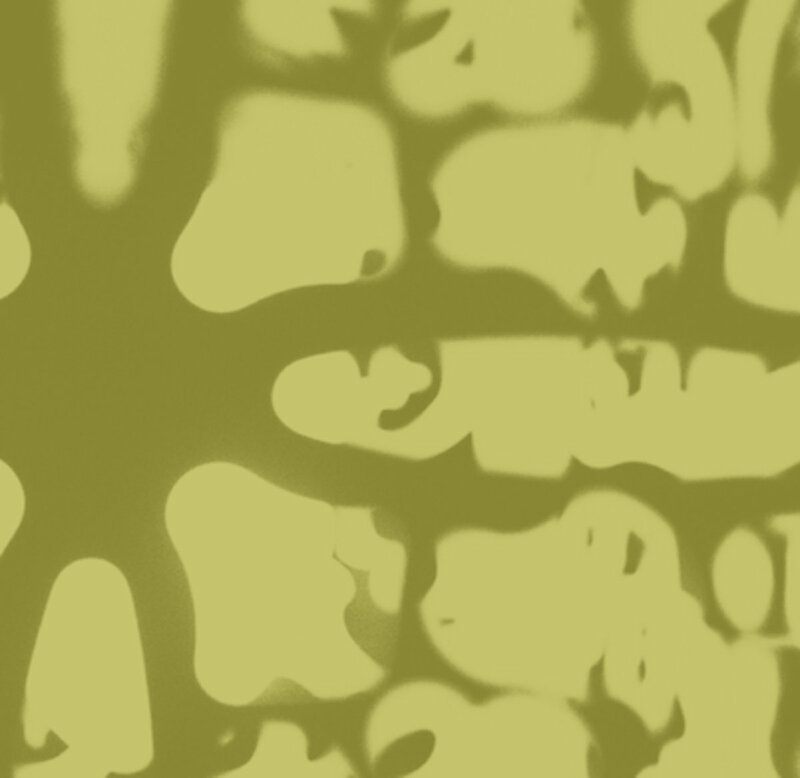 But it gave me a chance to create later my vision of Brainticket. My real Brainticket adventure starts now. Brainticket’s Cottonwoodhill was on the market and as I cut the contacts with the record company, I only heard various comments from outside; good, bad, divided, and that was all. I had tried to bring an unexisting group together and organize some concerts in Switzerland but nobody seemed to understand what we were talking about. 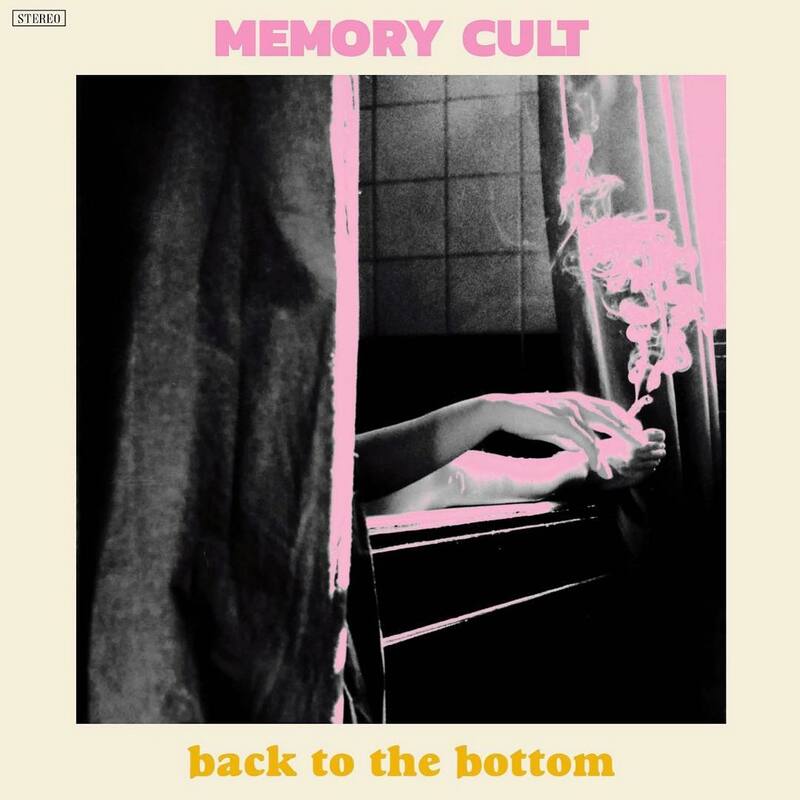 All the new waves came from the UK, USA and Germany with the Krautrock label. There were some rock groups around but what we were doing was too out of the way. So, we split up and everyone went his own way. It was nearly impossible to go on just by ourselves. What we needed was the support of music industry and a good manager. We were in the middle of the hippie revolution, freedom, flower power etc. that changed all of our life’s concepts. I lived during this time in a free hippy community and it was a great time. We heard music all day long, Jimi Hendrix, Pink Floyd, Janis Joplin, the Rolling Stones, King Crimson, and all of those new artists brought us strong messages. We played music around a fire, sitar, flute, guitar, percussions that got us into meditative states and we were happy. Every time I was more convinced that music should be a free experience, just play what comes out of you, at the start it might sound like a terrible cacophony, a terrible mess…but…but…suddenly it is happening and we are all on the same frequency, all get together like chaos changes naturally into order, into a divine harmony. This happens and you feel that you are in harmony with the Universe, with the Cosmos. I felt this many times just by improvising with very different musicians or maybe just with people who wanted to make noise, and it worked. It works when you play but more important is when you learn how to listen. From this very experience came out my concept of Brainticket. 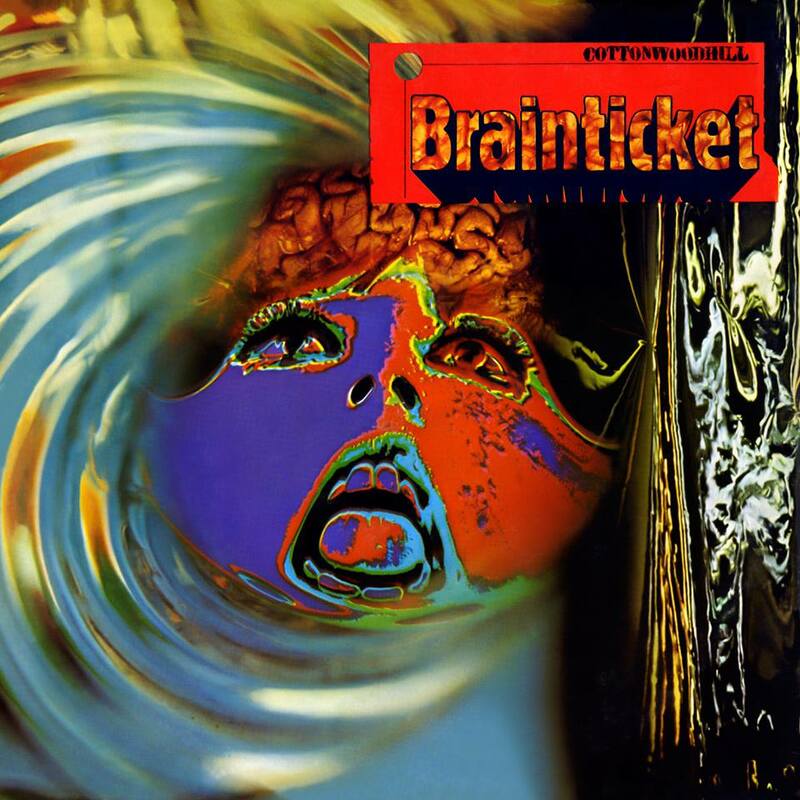 Brainticket is a result of what is happening through my musical experience with others. This is the main reason why every Brainticket record features different musicians. This made me decide to believe in Brainticket again, with a new concept. This was different, and it made me decide to move also to a different direction. Instead of going to UK, USA, Germany, we went to the south: Italy. Rome was the target. This was the new thing…make the difference! As they say: “All Roads Lead to Rome”. But first we stayed for a while in the south of Switzerland where I had some work to do at the Swiss television. We stayed there with some friends and local musicians, playing for ourselves and get to know each other. This, together with people I knew from the time before in Rome as a jazz musician, we got together some ideas for music productions. First we ended up in Milan, making recordings for Durium, a local disk company. 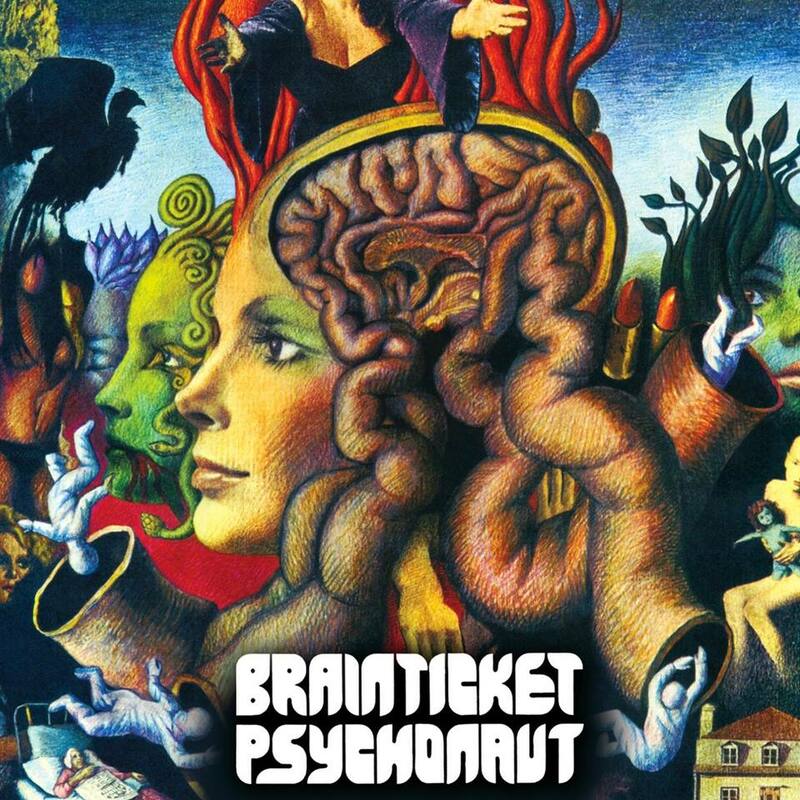 We produced Brainticket’ Psychonaut that wasn’t too bad. The artist who made the painting for the cover could really represent the state of psycho revolution of our lives at this moment. Umberto Santucci, a great Roman artist created the artwork. Hoping to be successful we started to organize concerts around but we did need some help. We counted on the record company to push us, do something, get the things moving. Unfortunately, no help, record not released and we broke up with them, of course with all the rights to the company. At this moment the record was out, as with their usual way to get rid of the artists and collect all the royalties. Once again they did it and we did not. 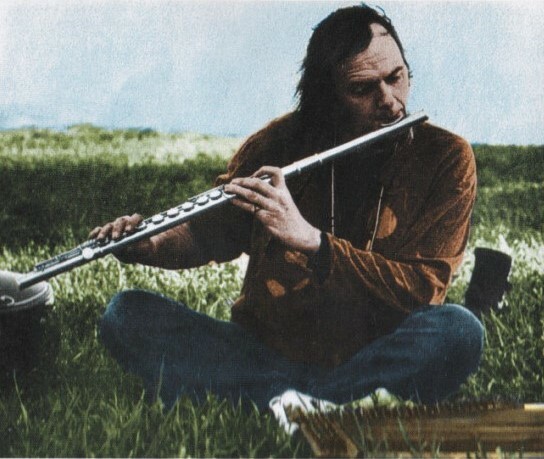 Some time passed and as I remember I ended up somewhere in the Swiss Jura with some of the musicians and other friends. As I always was seduced by the ancient Egypt culture, the mysteries of the pyramids, the gods and their followers, the beliefs of their afterlife experiences. Some years later I had the privilege to travel to Egypt and see all this with my own eyes. But for the moment I discovered the Egyptian Book of the Dead and it became my inspiration for the next music production that I would call Celestial Ocean. It tells the story of an Egyptian King on his afterlife experience. He sails on his ship, going through the arid dunes of the desert, reaching beautiful natural lands representation of life on Earth, then reaching the Rainbow of time, floating through the era of technology, discovering all sciences, going through all planes of consciousness and discovering the Space Between. Sealing through all dimensions, as music, art, and a multitude of spaces, the infinity of the universe, of the Celestial Ocean. I was inspired to draw the artwork of the record (LP) that shows the different stages of the story. With this line in mind we started to work on the music concept. We were three: Joel Vandroogenbroeck, organ, piano, synthesizer, sitar, flute, voice, Barney Palm, percussion’s, drums, guitar, Baja, voice, strange instruments, Carole Muriel, zither, synthesizer, strange instruments and voice. At that time we couldn’t afford to buy a synthesizer, enormous expensive, so we used small short waves radios for the special effects. Later on, we could finally get our hands on the EMS Synth, the one that was used on Pink Floyd’s Dark Side of the Moon. So, we had now the material together and we were ready for Rome – Italy. and a part of this I had the privilege to record for maestro Ennio Morricone. My life at this time really was magic, I met lots of very enthusiastic positive and generous people like never before. Celestial Ocean was to be released and we were asked to go on tour of concerts starting with Rome. Our first concert in Rome in front of 3000 people. Just before the concert, I had to sign a contract about the tour and they gave me the money for all the expenses, hotels, travel etc. We started the concert with all the money on me, finished the concert with success and suddenly I realized that all the money was gone! Stolen. How? When? I never could find out who did this! We had to complete the tour anyway by our own means, we slept in the van, eat only pizzas on the street, we were exhausted and desperate but in our sufferings we played so well as never before. As a final result, we ended back in Switzerland with an incredible experience behind us. Almost impossible to describe my feelings. That was Rome! Each one had to change course and go its own way, take distance. For the next years, I lived a completely normal life. 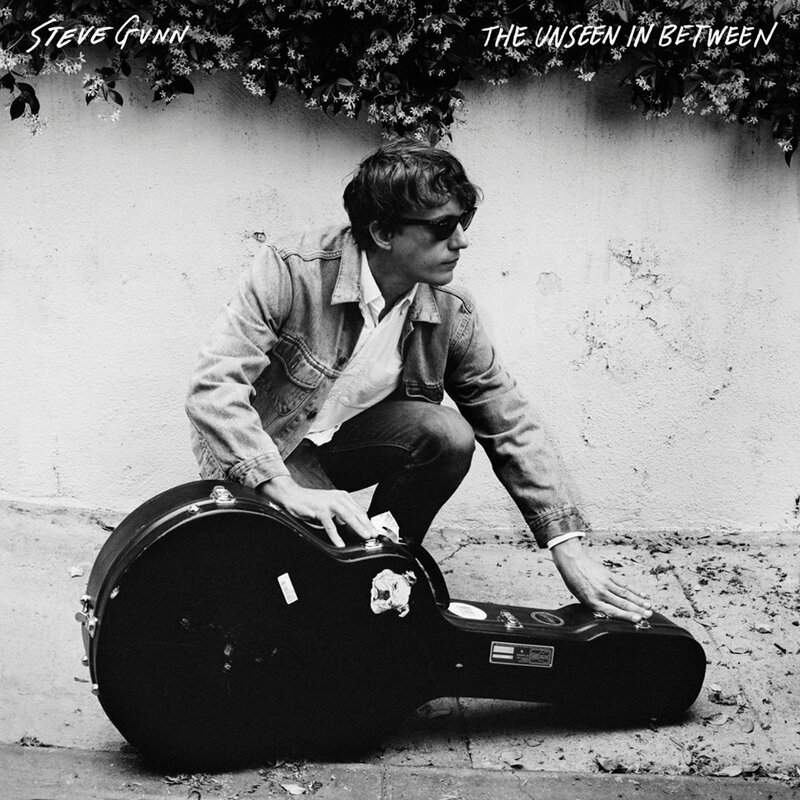 Teaching music, working at home with various projects, studying music. Making local concerts from time to time, studying astrology, participate on new age Congress. Finally I went to Egypt visiting all the ancient temples, play the flute in the great pyramid just like Paul Horn, amazing experiences. This also was the time when ‘minimal’ music started to appear. This was inspired by the music of Bali. I went to Bali studying the gamelan music. Very interesting to learn what one can do with pentatonic scale and with minimal sequences only. Back to Switzerland with extra luggage of Balinese bambu, I started to form a group of joged minimal music. The way to do it was to build your own instrument (joged) made out of bambu. This together with Javanese gongs, learning the traditional pieces and we started to give concerts that were a total success. It is very unfortunate that we never made a recording of it. Balinese selunding instruments are made of metal. What I learned was another version of Balinese instruments made out of bambu from Bali. Any other bambu like the Chinese ones are not fit for music instruments. My group was called The joged bumbung ensemble. During this time, we also jammed with other musician friends, and still with the same improvising Brainticket system, we produced two new Brainticket LPs called Adventure and Voyage. Mostly electronics involved in those recordings. 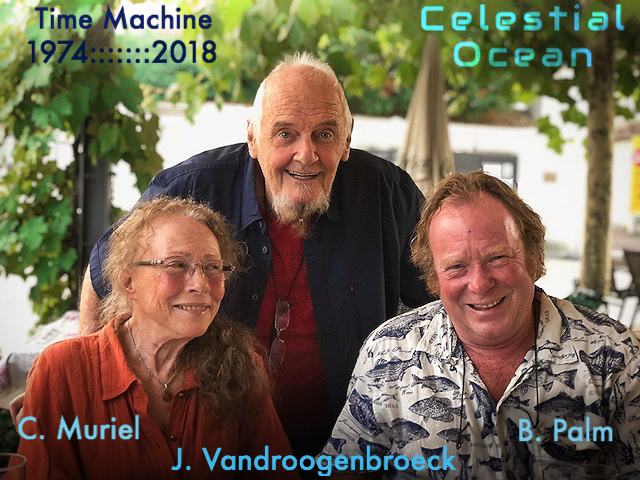 The state theater in Basel asked me to work on a theater production with classical ballet and the project was Celestial Ocean that had an enormous success. Of course I wanted the people to buy the RCA album, but of course it was nowhere to find and the record company did not find anymore the accounts data material. All was vanished in thin air. My conclusion is that the composer makes a new production, after that it becomes a product that is sold between all the record companies and the last one that is informed about this is the artist. Remember that in this time there was no internet yet and it was very difficult to trace something. Celestial Ocean became a classic! And I was not informed about any of this. Everything had been so wrong about Brainticket on this point of view. Sometimes later, as I also was composing for modern dance productions and various other activities, one day I received an invitation together with other artists to spend some time in the Djerassi Foundation located in California. The idea was to work on a production for 3 months and give a final concert. This was a wonderful time. A beautiful place in nature, the light, the color, the atmosphere, the beautiful city of San Francisco and surroundings, it was like magic. This beautiful time came to an end, like all good things. I wanted to stay but my path led me to Mexico where I stayed most of the time. It gave me also the possibility to know Los Angeles where I once tried to enter into the movie industry 20 years ago, without success. 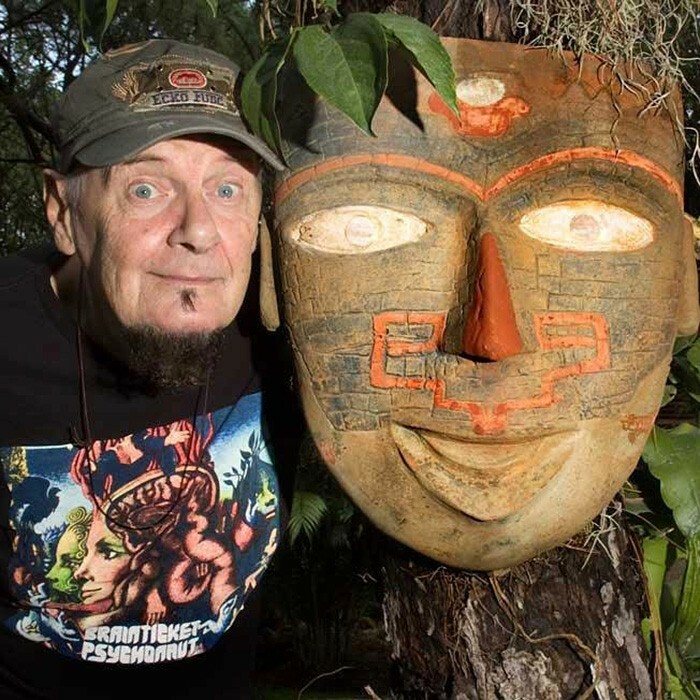 In between, I met some good friends in Florida, talking about music we made some home recordings and a production came out of it that was called Alchemic Universe. By this time in California, they were looking for me to recreate Brainticket. It worked and after producing the record Past, Present and Future, with a new group, we went on tour all across the US and it was a success. 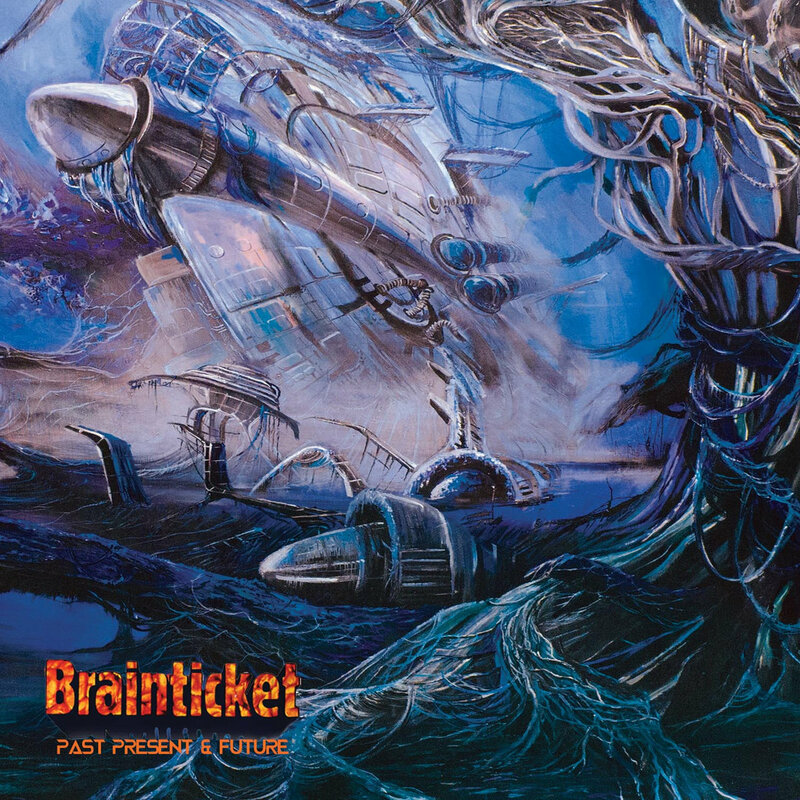 I never imagined that so many people knew us and still were big fans of Brainticket. At this time I could say that I had all the doors open in California. Unfortunately this is when I became unfit to go on because of serious health problems. I had to retire and ended my career. Sometimes things happen with a reason. This is the end of the story. My Brainticket life had been full of incredible moments, beautiful adventures, hard times and great times. A life full of rich human experiences and I am very happy about it. THE END!